This first tip might seem obvious, but some online advertisers still are not taking advantage of negative keywords. Using negative keywords will help you avoid unwanted clicks that can eat up a small budget rather quickly. Negative keywords can also improve your click through rate which is used to determine your quality score. A better quality score in AdWords can lead to lower costs. Want to know how to develop a thorough negative keyword list? Brain Dump – A brainstorming session is usually the best place to start. Are there color options you do not offer? Is this product only available in women’s sizes? Keyword Tools – Use tools to help find other possible negative keywords. I frequently use this Google Suggest Scrapper, be sure to select the proper language and the “expand” radio box. There are plenty of other keyword tools available online for free. Search Terms Report – On the keywords tab, you will see a box that reads “see search terms”, view this report regularly to see what keywords are resulting in clicks. If you see a keyword that you do not want to trigger your ads, add it to your negative keyword list. Implementing ad scheduling gives you the option to increase bids during certain times of the day or have your ads only visible between certain hours. With a limited budget, it is important that your ads are eligible during the times of the day that they are most likely to result in a conversion. In Google Analytics you have the ability to see AdWords traffic broken down by the hour of the day (Click on Traffic Sources > AdWords > Day Parts). Is there a time of the day that your AdWords traffic is converting at a higher rate, or not converting at all? Now that you know the best time to display your ads, you can implement ad scheduling in AdWords. On the “Settings” tab, under “Advanced Settings”, click the plus box next to “Schedule: Start date, end date, ad scheduling”, and then edit next to “ad scheduling”. 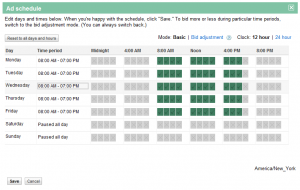 Below is an example of using ad scheduling to target users searching during a typical workday. Ad Scheduling is based on the time zone you selected when you created your account. This particular account uses east coast time and is targeting users in the Mid-Atlantic region. Just like targeting based on the time of the day, geo-targeting based on the likely hood of a conversion will help increase your return on investment. Google Analytics allows you to view paid traffic by location. In the top right corner you will see the Advanced Segments drop down menu, click on the “paid search” radio button. Next, click on Visitors > Map Overlay. How you segment by location depends on your business model. If you are an eCommerce retailer, it might make sense to segment by state. If you are a local service provider using your website for lead generation, it would make more sense to segment by city. Once you know what areas are underperforming, you can exclude those areas in AdWords or only target areas that are performing well. On the “Settings” tab, click edit next to “Locations” under “Locations and Languages”. Improving your click through rate can help reduce the cost per click by increasing your AdWords account’s quality score. For some advertisers who have a small budget it makes sense to only advertise on Google Search. To see if this strategy is for you, select the appropriate campaign, and then click on the “Networks” tab. Is the click through rate for “search partners” much lower than “Google search”? Is the conversion rate much lower for traffic sourced from “search partners” than that of “Google search”? These are both strong arguments for adjusting where your ads are displayed. On the “Settings” tab, click “edit” next to Networks under “Networks and Devices”. Deselect the radio button next to “search partners”. If you look at the example below, search partners has a click through rate is nearly 59% lower and reulted in no conversions. Knowing what ad position delivers the best results can help you get the most out of your budget. I’m not just talking about avoiding ego bidding; I’m talking about using real data to optimize your keyword position. You can view performance by keyword position in Google Analytics (click on traffic sources > AdWords > keyword positions). Once you know what position is ideal, you have two options as to how you will ensure your ad’s position. The first option utilizes the position preference feature available in Google AdWords. Select the appropriate campaign, click on the “Settings” tab, and then under “Bidding and Budget”, click the plus box next to “Position preference, delivery method (advanced)”, and then click edit next to “position preference”. Enable the position preference feature. You can now go to the “keywords” tab and select a position preference for each keyword based on the data in Google Analytics. This option can result in a sharp reduction in the number of impressions. The other option is to manually adjust bids until your keyword’s average position is optimal. The down side is this strategy can be time consuming, but your keyword should not experience a sharp decline in impressions. If you look at the screen shot below, keyword position "Top 2" has the highest conversion rate. The next step would be to ensure your ad appears in the "Top 2" position as often as possible. These are five easy tips that can help improve the performance of an AdWords account with a limited budget. I hope you find them useful.